Award-winning Chef Enrique Olvera Figueras of La Purificadora Restaurant at the La Purificadora Hotel en Puebla located in Puebla, Mexico shares a delicious taste of México with his recipes for Sea Bass "Cebiche" and "Esquites" with Mayonnaise Gelatin. 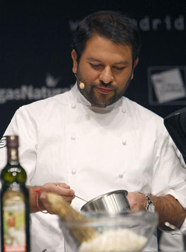 Chef Enrique Olvera Figueras was born in Mexico City and honed his culinary skills by attending The Culinary Institute of America in Hyde Park, New York where he graduated with honors. He continued his training working at the highly acclaimed restaurant, Everest, in Chicago, Illinois with celebrated Proprietor/Chef Joho. He returned to Mexico City a year later and has continued to garner culinary awards and accolades along the way, and is involved in Mexico's culinary avant-garde movement. I had dinner at La Purificadora Restaurant in late October 2009 when I was in Puebla and I was impressed with the flavors, style, and his approach to the haute "new" Mexican cuisine. Buen Provecho! Vinaigrette Method: Put all ingredients in a bowl and mix; check salt, and reserve. Cebiche Method: Cut the fish into ¼ inch x ¼ inch (1 x 1 cm) and put inside a vacuum packed bag with the vinaigrette, use medium pressure until the fish absorbs all of the oil and lime juice; let rest for 4 minutes. Open the bag and serve on a plate with the cherry tomatoes, the red onion, and the Serrano chile. Avocado Method: Put all of the ingredients in a bowl and mix, pass through a chinoise (a conical sieve with an extra fine mesh). Reserve in a bottle. Tortilla Paper Method: Mix the ingredients in a bowl to create a homogenous paste, pass through a choinoise and put on a tray with silpat. Bake at 215° F (100° C) for 20 minutes. Reserve. Serve on the plate with the cebiche and avocado purée. Corn Mixture Method: Remove the kernels from each type of corn and keep separate. Rinse the pozole corn and boil in cold salted water and cook until softened, strain, rinse, and reserve. In a separate pot, boil the blue corn kernels in cold salted water. Cook until softened, strain, rinse, and reserve. Sauté the garlic and onion in the butter in a large saucepan. Add the white corn kernels, cover with cold water and add the epazote branch and the "olotes" (corn cobs) from all of the types of the corn. Cook about 1 hour. Remove the cobs from the pan, and strain the rest of the ingredients into a chinoise. Reserve the strained clear soup separately. Reserve the corn kernels separately. Mix the three types of (cold) corn and keep refrigerated. To warm, heat in a small saucepan with butter and a cup of water. Check salt and season to taste. Mayonnaise Gelatin Method: In a bowl soak a gelatin sheet in cold water until it softens, about 5 minutes, set aside. In another bowl, add the egg yolk with the Dijon mustard and salt. Whisk the mixture until "fluffy," adding oil slowly, and end with the limejuice. Adjust seasoning. Strain gelatin liquid before adding to the mayonnaise. Slowly mix the mayonnaise with gelatin liquid and refrigerate in a mold ½ inch height (1.5 cm height) for a minimum of 3 hours. Reserve for garnish. Epazote Leaves Method: Heat oil in a frying pan and fry the Mexican epazote leaves between 2 slotted spoons of the size until the leaves are crispy. Drain on absorbent paper. Reserve. Presentation: Warm the corn mixture with water, butter, and season with salt. Boil the corn broth and season with limejuice and salt. Cut the mayonnaise gelatin into rectangles 2.75 inches length x 0.8 inch wide (7 cm length x 2 cm wide). Sprinkle 1 side of the mayonnaise rectangle with piquin pepper. Use a bamboo skewer for the mayonnaise gelatin. Serve the "esquites" in a tall (highball) glass, and sprinkle with grated white cheese. Garnish with the skewer of mayonnaise and a fried epazote leaf, Serve the seasoned "esquite" broth separately. Buen provecho! La Purificadora Restaurant is open for lunch Monday through Saturday from 12:30 pm until 5:00 pm, and on Sunday from 1:00 pm until 5:00 pm. The restaurant is open for dinner Monday though Sunday from 6:00 pm until 11:00 pm. Read about La Purificadora Hotel en Puebla in the Hotels and Resorts and Restaurants section. Please read other articles on Puebla, Mexico in the Destinations, Hotels and Resorts, Chefs' Recipes, Restaurants, Gastronomy, and Arts sections. Read other articles on Mexico in the Destinations section: Riviera Maya, Mexico and Ixtapa-Zihuatanejo, Mexico; in the Adventures section: Adventures: Maya Zip Lines - Flying High in Riviera Maya, Rio Secreto - Exploring the Riviera Maya Cenotes, Riding ATVs in Ixtapa-Zihuatanejo, Mexico, Biking, Kayaking, and Snorkeling in Ixtapa-Zihuatanejo, Swimming with Dolphins in Ixtapa-Zihuatanejo, Mexico, in the Hotels and Resorts section, in the Spas section, in the Restaurants section, in the Chefs' Recipes section, in the Liquor Cabinet - Scorpion Mezcal, and in the Music Scene section: Paco Renteria Interview and Paco Renteria - Gitanus and Oceano. For information on Puebla, Mexico, please visit the website: www.VisitMexico.com.